The online snowboarding game Steep will soon be getting an update, which will include a new map, community challenges, and a tournament. The update will be live on February 10th. The map will be that of a mountain in Alaska. All players will be able to access the new Alaska region, completely for free. 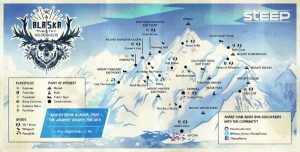 The Alaska region will also introduce some of the first “Branded Challenges,” which will be “unique challenges” that are intended for the “the fiercest players.” Those that take on the challenge will be awarded both reputation points and Steep credits. Branded Challenges are also set to be introduced to the Alps in the near future. The game now also has “Community Challenges”, which are of course its player made challenges. The Steep development team will also make use of the Community Challenge system themselves, allowing players to compete for high scores with the development team directly. And finally, Ubisoft announced that Steep has received a new World Tour mode. Similar to The Crew’s Summit tournament, the World Tour is a monthly tournament.